2nd edition of Glasgow Games Monitor 2014's occasional freesheet, published Winter 2010. A Compulsory Purchase Order (CPO) is a legal function that allows city councils or other bodies to obtain land or property without the owners consent. 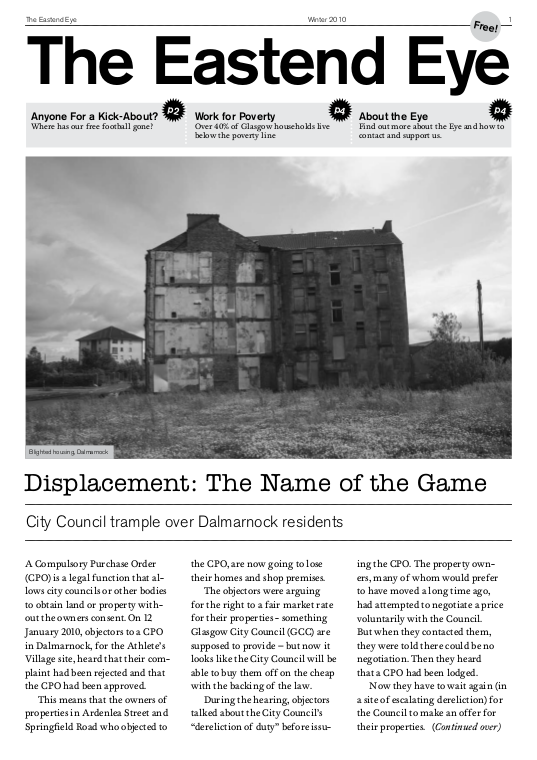 On 12 January 2010, objectors to a CPO in Dalmarnock, for the Athlete’s Village site, heard that their complaint had been rejected and that the CPO had been approved. This means that the owners of properties in Ardenlea Street and Springfield Road who objected to the CPO, are now going to lose their homes and shop premises. The objectors were arguing for the right to a fair market rate for their properties - something Glasgow City Council (GCC) are supposed to provide – but now it looks like the City Council will be able to buy them off on the cheap with the backing of the law. During the hearing, objectors talked about the City Council’s “dereliction of duty” before issu- ing the CPO. The property owners, many of whom would prefer to have moved a long time ago, had attempted to negotiate a price voluntarily with the Council. But when they contacted them, they were told there could be no negotiation. Then they heard that a CPO had been lodged. Now they have to wait again (in a site of escalating dereliction) for the Council to make an offer for their properties. The Reporter in the hearing noted that he had ‘sympathy’ with the position of the objectors and called for the Council to take a pro- active stance to address the problem. But the alleged ‘public benefit’ of the Commonwealth Games apparently outweighs these interests. CPO’s are supposedly, or so the government guidance says, only to be used where there is a strong ‘public interest’ benefit in a public authority obtaining the land to use for the wider good. In reality, CPO’s are increasingly used as a tool to ease and legitimise land grabs and the transfer of land and property ownership from ordinary people to large development companies working on an enormous scale. The related M74 road development is a perfect example. When the Scottish Executive’s local independent enquiry found that the road “should not proceed”, the decision was immediately overturned by the then First Minister. He argued that the ‘wider public benefits’ of the road created ‘exceptional’ circumstances which meant that the road should go ahead - despite a democratic process rejecting the road on the grounds of negative health, economic, environmental and community severance impacts on local populations. Back in Dalmarnock, the Athletes Village will eventually create 1,200 homes for private sale and 300 for private rent (the ‘promise’ to provide 300 ‘socially rented’ homes has now fallen by the wayside). In an area marked by deep poverty, this deficit in affordable housing provision surely can’t be seen as part of the wider ‘public good’; neither can riding rough-shed over local objections to the CPO. But then then Dalmarnock isn’t Disneyland, and maybe the ‘public good’ isn’t the point after all. Time to wake up and smell the coffee? Anyone Fancy a Kick-About ? Where has our free football gone? Have you ever walked by one of the many neglected urban public football pitches around Glasgow and thought it reminded you more of the news footage from a war-torn country than a local space for playing the beautiful game? The east end has its fair share of these football pitch- come-bomb sites: within a few square miles, areas such as Calton, Dalmarnock and Parkhead all exhibit signs of urban decay. Yet this stands in glaring contrast to the millions of pounds thrown at the 12-day TV extravaganza known as the 2014 Common- wealth Games (currently over budget by £81m, with four years still to go!). This is a sad sporting irony. Basic concrete or ash playing surfaces might not compete with the stadiums of Parkhead and Ibrox, but they have played their part for generations of youngsters and oldies alike who have made use of free ‘on your doorstep’ facilities. These modest public places are not to be scoffed at; almost 1 in 3 Glaswegian households is with- out a wage earner and amidst the worst recession in years, the appeal of affordable and accessible forms of entertainment and leisure are foremost in many peoples minds. Not to mention the health benefits: Glasgow has struggled with the ‘sick man of Europe’ tag for decades and the shocking under-investment and neglect of existing public facilities by successive councils has done nothing to improve this situation. You may have heard talk of the Commonwealth Games ‘Legacy’; a supposed ‘trickle-down’ effect for the local population and its economy in terms of jobs proposed and houses. 1,500 Yet, homes only 300 from of the the are athlete’s planned village for rental in Dalmarnock housing on the market - already backsliding from the initial ‘promise’ that these houses would be for socially rented ‘affordable’ housing (e,g. Housing Associations). And what type of jobs are on offer? Jobs to sustain communities, or just more low-paid, temporary contract and service sector jobs which are a by-product of the ‘conference city’ Glasgow has become? The question arises: whose legacy? A legacy for local people? Or a legacy for private developers and businessmen? There are positive responses to council cutbacks and the corporatization of our ‘common good’ land. Across the city, in the Wyndford scheme of Maryhill, locals have been actively taking responsibility for their community by renovating the existing football pitch within the housing estate. The hard work of local School Activities Programme’ (ASAP), run by Stephen Koepplinger (who has a track record of bringing decrepit sports facilities back to life), should embarrass those councillors who make lofty promises of ‘sport for all’. Yet, instead of investing comparatively tiny amounts of money (the Wyndford project requires only around £1,000) in existing free facilities, these same councillors are busy smoothing the progress of private business with multi-million pound contracts for ‘regeneration’ projects, which are usually just gentrification projects (land grabs led by private developers). Instead of more privatisation and ‘elite playing fields’, why not imagine a future where our kids are out playing in our own communities, not fighting in them! Football is a game for everyone, rich or poor - and we want to keep it that way. Rangers and Celtic started from humble beginnings on Glasgow Green, a public green whose freedom of use was fought for over the years. The same grassroots activism and community involvement has to be organised now if we want a chance to give to flourish future generations – the inspiring community initiative of the Wyndford residents and Stephen Koepplinger point us towards that future. Over 40% of Glasgow households live below the poverty line. A recent report by Andrew Cumbers, Gesa Helms and Marilyn Keenan, argues that work and job training policy is ill-equipped to deal with the reality facing the unemployed and low-paid workers. The report states that the “the norm” in Glasgow is “becoming a low wage and casualised work environment, or an unregulated and degraded training system”. The report outlines the lamentable context first. Glasgow exhibits some of the worst levels of poverty and social inequality in Western Europe: over 40% of households in Glasgow live below the poverty line. The shift from manufacturing to service sectors has been accompanied by, “the decline of full-time work and the growth of a part-time labour market”. Part- time employees typically have fewer employment and pension rights than full-time employees as well as lower union member- ship (resulting in lower wages). Employment growth recorded in the ‘boom years’ actually represented “degraded” and less well- paid work. Even the growth in female employment was typically in “low paid, part-time and casual work”. Many women now have to work two jobs to make up the difference. The economic recession is intensifying the situation. A growing number of graduates are forced to compete for non-graduate level jobs (e.g. call centres), putting pressure on scarce employment opportunities. So called ‘welfare reforms’ will add further downward pressure on wages as poor people are thrown off benefits and forced into ‘workfare’ schemes and low-paid work. The report highlights the difficulties that young people experience in finding decent training and job opportunities: there were 2,000 applications for just 75 Modern Apprenticeship places in 2007. And the lack of training regulation means that, “young people are open to increasing exploitation and sometimes abuse by employers”. Volunteering is seen as a positive step for young people; the 2014 Commonwealth Games, for instance, is seeking 15,000 volunteers. The report concedes that volunteering may be beneficial in some cases, but argues that these schemes, usually involving up to 15-16 hours a week on basic benefits, “in a broader sense have an exploitative aspect to them”. The report summarises by arguing that young people need to be paid ‘living wages’ (a wage that allows an existence above the poverty line) in return for paid work, and given properly regulated training and work placements. That is the least we need to demand. The question arises: whose legacy? A legacy for local people? Or a legacy for private developers and businessmen?